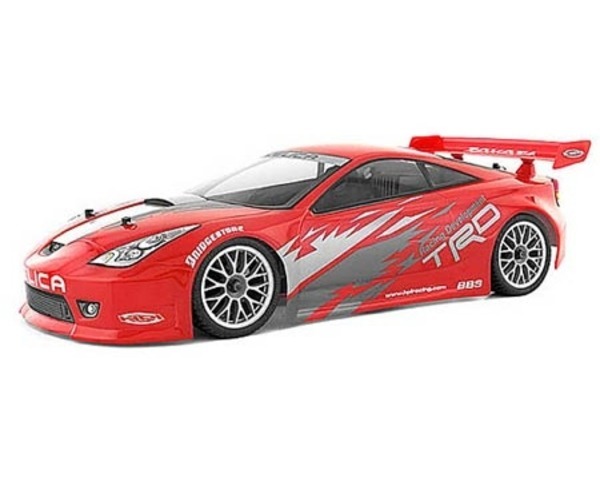 1/10 Toyota Celica Body, 200mm wide Body for R/C Cars. thin, clear plastic piece that covers the car's chassis and provides the "shape" of the car. Clear spoiler, and mounting hardware are included. Highly detailed body and cutting lines. Body has a clear protective overspray film on the outside that is to be removed after painting. Self-adhesive flexible decals of Toyota Celica logos; details of window trim, head and tail lights. One HPI instructions/body sales flier. Two 3x12mm phillips button head screws (to mount spoiler onto body). choice is up to the modeler. Body scissors to cut out the body and spoiler parts. Hobby knife or scissors to cut out the decals. Front Holder for Differential Gear/Woven Graphite, Trophy 3.5/4.